Prasanth completed his Bachelor’s Degree in Physiotherapy (BPT) from the Tamilnadu Dr. MGR Medical University, India in 2010. 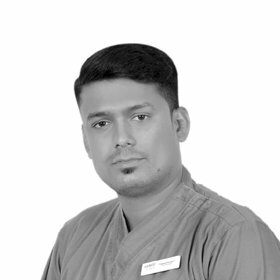 He has over six years of experience in the field of Physiotherapy including Orthopaedic outpatient clinics and Sports and Neurological rehabilitation. He has specialized in outpatient Physiotherapy including assessment, planning and implementing condition based treatments. He managed all clinical conditions such as neck and back pains, soft tissue and joint problems, sports injuries and rehabilitation of Orthopaedic surgeries. His field of interest includes manual therapy, pain management, exercise prescription for special needs and Fitness training.